We know that there is nothing worse than having a house full of junk. Handy Rubbish can help with your waste disposal in Woodside. We have an amazing team of CR0 rubbish removal experts who can help you get rid of all of your clutter without too much fuss. Why bother with having to load up a rented van, and then drive it to the various places where you need to get rid of the junk? We can do the work for you. Our experience in the industry means that we can do the job quickly and cheaply, meaning that you get great results without having to worry about it! No matter the size of your Woodside waste removal task in the CR0 district, we can get to the bottom of it, and make sure that there is no chance of anything going wrong. Whether it is a domestic clearance, or a large commercial job, we will be able to give you a quote. You may have a few tons of builder’s rubble that needs to be shifted. You may alternately have a couple of sofas - it does not matter to us! We always provide excellent rubbish clearance services in Woodside, CR0, no matter what that junk is! Why not give us a call today on 020 3540 8282 and we can give you a quote for your rubbish disposal in Woodside. When you are considering CR0 waste clearance, you may not have thought about the implications of cleanliness. Having several bin bags can leave a fair bit of mess with leaks, so imagine if there was a lot more! We deal with large amounts of waste and scrap every day, so we have the experience to deal with these things correctly. You don’t want to get your car dirty or dusty when doing your own rubbish removal, so let us do it! We have an amazing array of vehicles that are perfect for the job, to make sure that your clearance is done with ease. You will find that having large vans at our disposal means that we can move a lot of waste very quickly, which means less hassle for you. We can work to your timings and schedules, so that your property clearance is totally stress-free at your end. We do the heavy lifting and the dirty work so that you don’t have to. 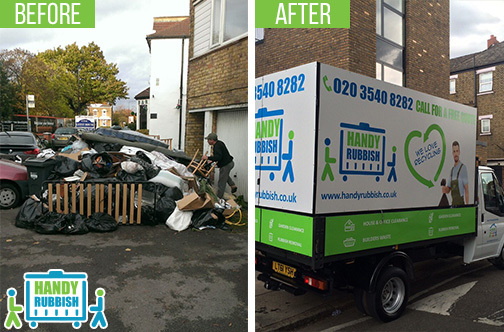 Call Handy Rubbish on 020 3540 8282 for the best waste collection in Woodside. Rubbish disposal was a piece of cake for their team in CR0. I called them for a job in Woodside, the standard of service was exceptional and the price I ended up paying was reasonable. It was a great deal indeed! - Reviewed by Josie L.
Woodside is an area within the London Borough of Croydon, in the South East of Greater London. The area sits between South Norwood and Addiscombe, and is very close to Elmers End, Shirley and Selhurst. 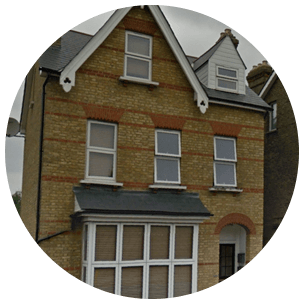 The area is served by its own railway station, Woodside station, and is near to Norwood Junction railway station, which has easy links to London Bridge and Victoria train stations. The area is based around a green called Woodside Green, which is surrounded by residential properties, some of which are remaining examples of the old village, which gives the green a village air about it. There is a main shopping area at one end of the green however, and as Portland road leads away from the Green, there are many more shops and places to visit to be found. The station gives access to Croydon and Bromley, with road and bus links into London. This makes it a great area to settle and work in, or commute into the city from.